Chances are your questions have been asked before. Here are the questions we are asked most frequently. Q: Do you have beach chairs? A: It depends... we always have chairs at the beginning of the vacation season, but sometimes they get broken during the summer. So we try to have a couple of chairs there, but can't guarantee it. 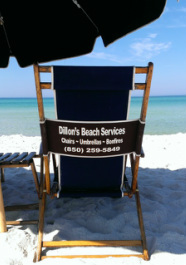 A great option is to contact Dillion's Beach Service at 850-259-5849. They will deliver and set up for you each day for a small charge. A: We have a couple of beach towels in each bedroom for your use. Q: Is there a TV in each bedroom? A: There is a TV downstairs in the Living Room and another upstairs in the bedroom with 2 beds. Both are "smart" TVs and are connected to the internet and have Netflix. We do not have cable service. You can connect wirelessly and stream most anything from your laptop or tablet. Q: Is there wireless internet? Q: How many parking spaces are there and how far away are they? A: There is ample parking for 2 cars directly in front of the condo. Q: How far is it to the beach? A: Not far at all! 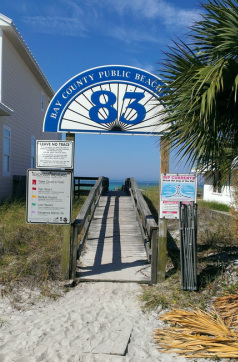 It's about 50 yards to the beach walkway and maybe another 50 yards till your toes are in the water. Walkway #83 is closest. A: No, sorry! I had a really bad experience when I allowed someone to bring their pets and it cost me more than $2000 to repair the damage. Don't get me wrong, I love my animal friends too, but I've had to make it a policy to say no. Q: Is there a gas grill? A: Yes. We ask that you clean it after you use it though, so it's not stinky for the next person. Q: How far is Pier Park? A: About 5 miles away. If you think of anything else you need to know, by all means ask!